In the last decades, free radical processes delineated an interdisciplinary field linking chemistry to biology and medicine. Free radical mechanisms became of importance as molecular basis of physiological and pathological conditions. Lipids, in particular, unsaturated fatty acids, are susceptible of free radical attack. The reactivity of the double bond toward free radicals is well known, in particular the reversible addition of radical species to this functionality determines the cis–trans double bond isomerization. Since the prevalent geometry displayed by unsaturated fatty acids in eukaryotes is cis, the occurrence of the cis–trans isomerization by free radicals corresponds to the loss of an important structural information linked to biological activity. The formation of trans isomers can have important meaning and consequences connected to radical stress. Free radical isomerization of membrane fatty acids has been the subject of research coupling the top-down approach by model studies, such as biomimetic chemistry in liposomes, with the bottom-up approach dealing with the examination of cell membrane lipidome in living systems under several physiopathological conditions. Methodologies and molecular libraries have been settled, for both liposome experiments and the examination of the radical stress in biological membranes. 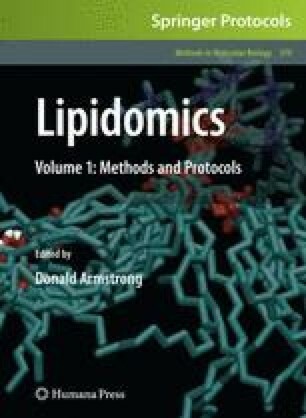 This chapter will give an overview of the current procedures used for liposome models and the cis–trans isomerization experiments, in order to build-up a library of trans geometrical fatty acid isomers. The authors wish to thank all collaborators that helped to develop methodologies in an interdisciplinary context. Support and sponsorship of the COST Action CM0603 “Free Radicals in Chemical Biology” is gratefully acknowledged.